During spring, don’t add heavy foods to your diet: steer clear of sugary sweets (even foods that are overly sweet and heavy, like sweet potatoes, cream, heavier meats like beef and pork). You’ll also want to cut back on rich, oily food, butter, salt, sour, and all of those delicious things you’re likely craving. Eating a springtime diet that’s easy to digest is key. Opt for meals chock-full of bitter greens, like kale, spinach, broccoli, including some green bell peppers, draws out excess moisture from your body and helps keep the colds away. You can certainly whip up kichadi (get your kichadi recipe here); it’s light and easy to assimilate. Or try substituting in lighter grains like quinoa or barley for rice. You can even lighten grains further by toasting them in a dry pan for a minute before you cook them. 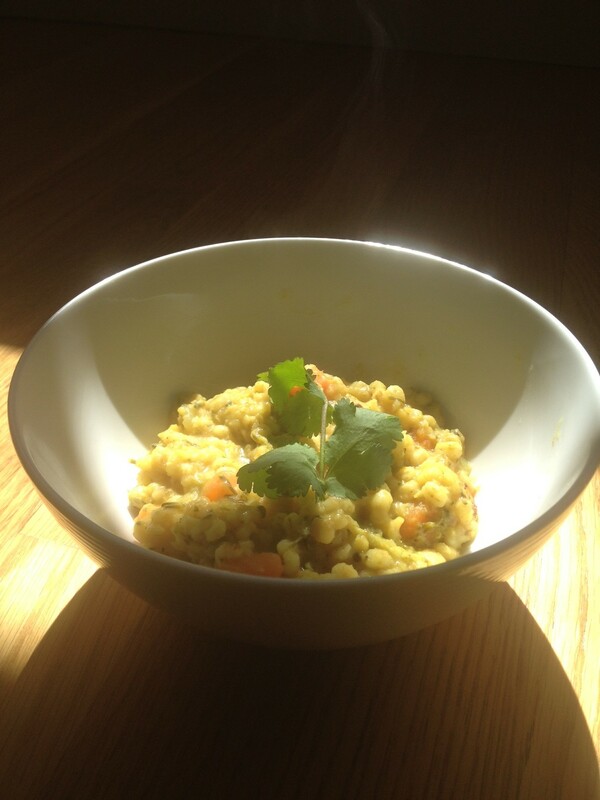 Here’s a recipe I created just for springtime: barley kichadi! I ate it today, in fact. With its nutty flavor and firm texture, barley is great for pulling excess moisture out of the body. Perfect for spring! Add 1 tbsp ghee to a soup pot (or use a pressure cooker if you have one), spoon in ¼ tsp turmeric. Let that roast for about 30 seconds, then add in veggies. (You can add a bit of water if things start smoking.) Then add in barley and beans, sautee for another minute so everything is coated. You’ll know it’s done when all the water has been absorbed and the barley is soft with a little bite. The beans will be mostly assimilated. If this hasn’t happened, add a bit more water. Heat up remaining ghee (or oil) on the stove, and then add cumin seeds and black pepper. Sautee the seeds and pepper for a minute, allowing them to sizzle. Then pour this on your barley-bean mixture. Add salt to taste and a sprig of cilantro. Serve immediately. Let me know what you think and of course, post your questions below. This entry was posted in Recipes and tagged allergies, ayurveda, barley, cold, cough, dharmabytes, kichadi, lentils, recipe, season, sick, spring, winter by Alex Krasne. Bookmark the permalink.